Got the Dieci back from Jett Tuning: http://www.jetttuning.com They went through the bike quite thoroughly, and boy am i happy I had them look at the bike. I should have done this a year ago. Carbs were not in the best of shape, needed fork seals, coolant flushed and system tested, oil and filter changed, new battery and they cleaned my fuse box. It runs like a champ. Special thanks to John and Pete. I do have to say the shop approved my fuel filter and plumbing so again, thanks to all those that chimed in with advise and pictures! Planning to spend the weekend cleaning and buttoning up the fairings. The reward should be the Sunday morning ride. Carbs on and off is the painful bit! Fork seals I have avoided thouching myself. Thank you for posting the pic Steve! sorry but the method of posting pics here is the only gripe I have with the forum. Steve, thanks for the explanation, will have to give it a go. Took the bike out today and it was great. Rode up to the Rockstore, got a lot of thumbs up. BTW, got to ride my friend's F4 as well. I should have called today Tamburini Day... However, maybe I shouldn't have done that on the same day i rode the Dieci, really made me feel the YB10's true age. Awesome - I want one! Must admit I do like mine. It's got just under 700 miles before the book says the valve clearances should be done and I have to be honest I am not looking forward to that. 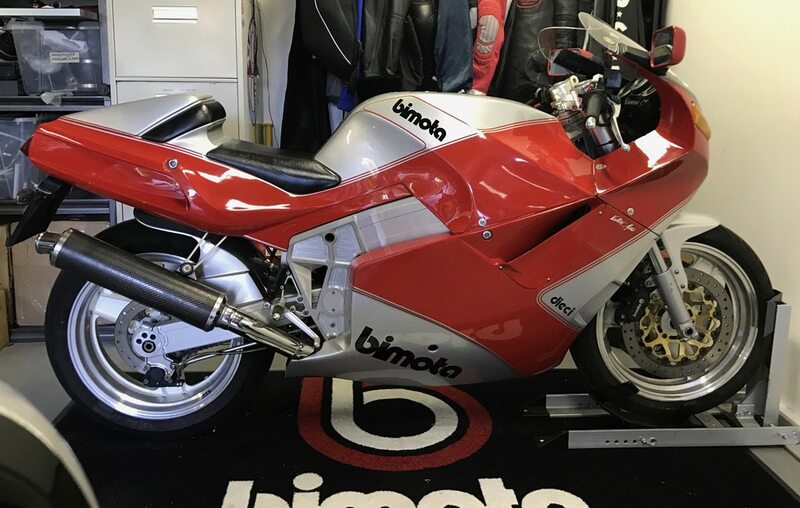 I am in the middle of a TESI 1d service and boy you got to love Bimota's. Never was much of a Yamaha fan but it is such a lovely forgivable bike to ride with loads of grunt. And it looks nice. Those white wheels and hell to keep white though. the trick to keeping white wheels clean is to clean them after each ride. its a pain, but i love the white wheel centers contrasting with polished rim. Yea problem with the outer rim is mine are a bit pitted and I'm wondering wither I should try and polish them up or paint the all white. They are laquered as standard I think. The laquer is coming off mine though.